Crisis can strike any time, day or night. When feelings of hopelessness, isolation, shame, and anxiety lead people to think that suicide is their only option, they can't wait for help. They need to talk to someone at our suicide and crisis hotline...now. If you are in crisis or have suicidal thoughts, please call our suicide crisis hotline at 214-828-1000. You can also text "CONNECT" to 741741 anytime to reach trained, caring volunteers at the National Crisis Text Line. Suicide is a public health issue that should be handled with care and sensitivity when it comes to reporting by various news and media outlets. This is especially true in regard to headlines that may sensationalize or glamorize death, whether it be intentional or not. While such headlines may capture the reader's attention, an unintentional effect can be a higher risk of additional suicides. If you are a member of the media or press reporting on a suicide, please click the View Guidelines button to download best practices for reporting on this tragic public health issue. Stay in-the-know by signing up for email updates on upcoming events and important information and statistics. 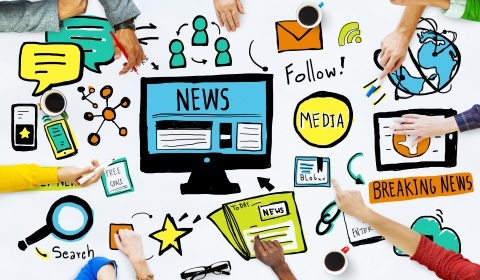 You will also have access to newsletters that contain stories and articles about suicide, tips on surviving (for survivors of suicide), and information about current and/or past events. 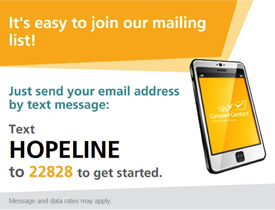 You can sign up for updates by clicking on the button below or text "HOPELINE" to 22828 (message and data rates may apply). We offer crisis debriefing to groups such as businesses and other organizations in the aftermath of suicide. This unique program helps those who have experienced the tragedy of losing a loved one to suicide. We offer crisis intervention training to community groups. We offer mental health screenings for youth as well as suicide awareness training for schools. Our staff facilitates debriefing sessions for suicidal incidents in schools and other organizations that serve youth. 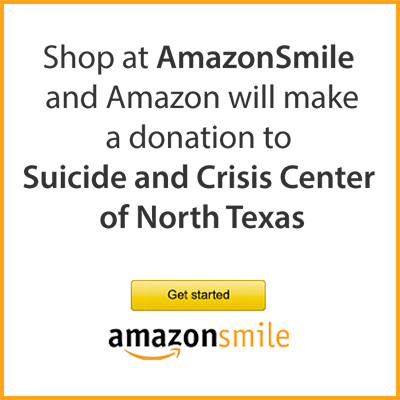 Shop at AmazonSmile and Amazon will donate 0.5% of the price of your eligible AmazonSmile purchases to Suicide and Crisis Center of North Texas whenever you shop on AmazonSmile. Don't forget to link our Good Neighbor Number (1006) to your Reward Card and help us raise funds the easy way! Suicide is the 12th leading cause of death overall in Texas. On average, one person dies by suicide every three hours in Texas. More than twice as many people die by suicide in Texas annually than by homicide.